Perry Bellegarde, national chief for the Assembly of First Nations (AFN) spoke at the University of Manitoba last week, outlining the priorities of the AFN going into the federal election. The speech, which detailed the central planks of the AFN policy document “Closing the Gap,” referred to the difference in quality of life experienced between indigenous and non-indigenous Canadians. Canada as a whole is ranked sixth to eighth on the Human Development Index (HDI), while First Nations are ranked between 63rd and 78th, according to the AFN. Bellegarde called for the two-per cent federal funding cap for programs and services on First Nations reserves, which was put in place in 1996, to be lifted. Since then provincial governments have received funding increases of three to six per cent annually from the federal government for similar services and programming. Bellegarde said that education is the way forward when it comes to closing that gap in living standards. First Nations receive approximately $6,500 per child for education, while the provincial education average is around $10,500 per child and the French-language school system can be up to $20,000 per child. 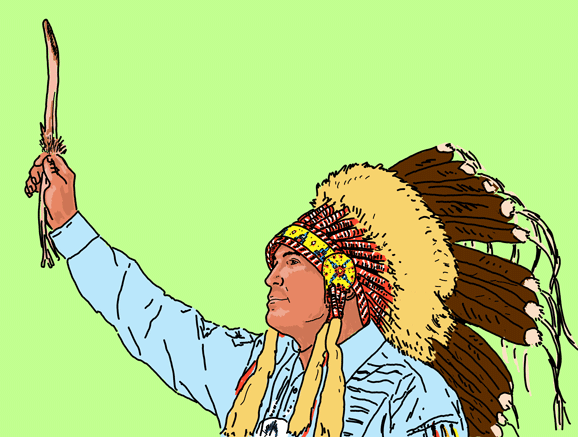 Bellegarde began as national chief on Dec. 10, 2014. He came into the position at the AFN after the former national chief, Shawn Atleo, resigned in the midst of controversy over Bill C-33, the First Nations Control of First Nations Education Act. Work by previous national chief Shawn Atleo with the Conservative government to implement Bill C-33 was met with strong criticism. Many regional chiefs felt that Bill C-33 did not respect First Nations’ sovereignty, and that the funds promised were inadequate. Conversations came to a standstill last year that led to the Atleo’s resignation. The legislation would have increased federal funding and provided a new structure for administering education on reserves. The Manitoban asked Michael Mendelson, senior scholar at the Caledon Institute of Social Policy and author of the report “Improving Education on Reserves: A First Nations Education Authority Act,” if there is hope for a broad agreement with the federal government. “The main requirement is that all First Nations have to be able to opt in or out, and not be forced to fall under a new act as they were under the Education Act proposed by the Harper government,” Mendelson said in an email. John Richards, professor at Simon Fraser University’s school of public policy, was a part of negotiations over Bill C-33 and regrets that an agreement was not reached. In terms of education, Richards also cites high school completion as being critically important for future success. Manitoba in particular has a low high school graduation rate for students living on reserves – around 30 per cent, according to Richards. He is hopeful that talks on the Education Act will resume after the federal election on Oct. 19. Deborah Young, the U of M’s executive lead for indigenous achievement, told the Manitoban that post-secondary institutions play a critical role in closing the gap between First Nations and the rest of Canada. This means creating a welcoming space for students when they first arrive on campus, Young said, adding that resources need to be culturally sensitive with a focus on relationship-building. “Our university is committed to ensuring that First Nations, Metis, and Inuit students are supported at all stages of their learning journey,” Young said. The university has projected that by 2026, 19 per cent of students at the U of M will be indigenous. The Truth and Reconciliation Commission (TRC) report was released in early June and made several recommendations for the improvement of the First Nations education system. The commission gathered research and collected survivors’ stories from the Indian residential school system, in which 150,000 indigenous children were forced to attend mandatory boarding schools between the 1880s and the mid-1990s. The report released 96 recommendations for action to bring further reconciliation to Canada. The TRC recommendations include more funding for indigenous Canadians who would like to obtain a post-secondary education but are unable due to lack of funds, funding to train post-secondary educators in indigenous peoples’ knowledge and teaching methods, and co-operation between Aboriginal peoples, the Social Sciences and Humanities Research Council, and the National Centre for Truth and Reconciliation to establish research programs on what reconciliation means in Canada. The U of M is home to the National Centre for Truth and Reconciliation, which holds records and oral history on the residential school system. The collection is located in Chancellor’s Hall, 177 Dysart Road. Further discussion on “Closing the Gap” will be held on Oct. 7 in an open forum on First Nations and the 2015 federal election. The event will be held at River Cree Resort in Enoch, Alta. All federal party leaders have been invited to the forum. Correction: The original version of this article mistakenly stated that the “Closing the Gap” report called for the federal government to work again with First Nations to implement Bill C-33. In reality the AFN does not want to re-engage on Bill C-33. Rather, the report calls on the government to re-engage on First Nations control of First Nations education. We apologize for the mistake.